Early February 2012, we arrive in Ho Chi Minh City, a place we visited briefly in 2008. Only 36 years have passed since the end of the Vietnam War, and, while we are not there as war tourists, we can’t ignore the evidence of that recent past. For example, in the War Remnants Museum in Ho Chi Minh City; in the nearby Cu Chi tunnels; in shops selling reproduction propaganda posters; in reafforestation projects still revegetating land recovering from Agent Orange defoliation. Against that sombre background, we set out on a 10 day tour from hot and steamy Ho Chi Minh City (AKA Saigon), heading north to Hanoi. 8/2/12 – 9/2/12. Saigon is a mad house of traffic as usual. 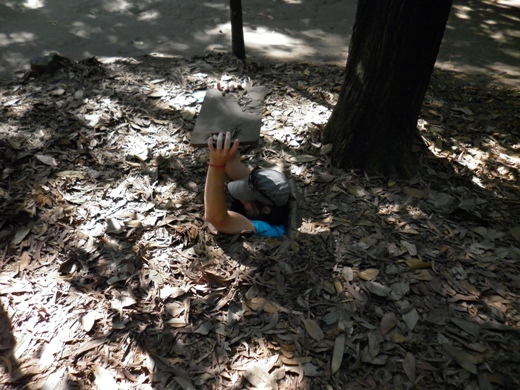 At the Cu Chi Tunnels, some 40 km from Saigon, our Intrepid Travel guide, Son Le, (“Call me Sunny.”) tells us that a few of the passageways were widened – so that fat tourists can see where the Viet Cong lived and fought during the war. I venture underground. The tunnel is narrow and as black as night. I have to stoop doubled over to proceed. Not normally claustrophobic, after about 10 metres I’m glad to get out. Next door to the tunnels complex is a military shooting range. Here, for a few dollars, eco-tourists can blast away at targets, using vintage weapons from the war era. My choice is an AK 47 (Automatic Kalashnikov) and I happily blast 10 rounds at a distant target. Don’t think I killed anybody, but seventeen bucks well spent. It brings back distant memories of more accurate shooting with a 7.62 calibre SLR, as a recruit in the Regular Army at Kapooka, a million or so years ago. That evening we hop on the Reunification Express, en route, via Da Nang, to Hoi An. Sunny doesn’t recommend the on board food, unless you’re an instant noodle freak. Consequently, everyone is carrying food supplies and bottled water for the 17.5 hour trip. Trying to sleep in my first class, cramped upper berth, I find there is no way to adjust the freezing air conditioning – a cool night’s sleep follows. 10/2/12 – 12/2/12. Our pleasant hotel, the Van Loi, is in Cam Nam village, set on a small island in the Thu Bon River. A few minutes’ walk away is the beautifully restored, if touristy, ancient quarter. Wandering around the quarter, we catch a traditional Vietnamese musical concert in the Hoi An Art Craft Workshop. Highly entertaining is a player plucking a dan bau. “Dan Bau?” You’ll get the idea if you can picture a one-string lap steel guitar with a vertical whammy bar, played in harmonics. 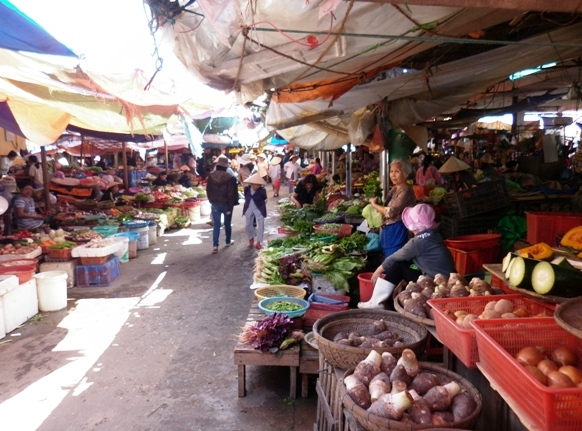 Bustling markets on the river front adjoin surrounding streets – these are lined with small restaurants and shops. In the restaurants, most main dishes cost between $1.50 and $4. With meals we drink Beer LaRue, at about 80 cents a can. That evening we visit the Giaon Cooking School, where the amiable Ms Hanh runs professional classes in her home. Ms Hanh eases us through the recipes and ingredient preparation, which we then cook for our shared dinner. Menu staples are shredded papaya salad, spring rolls, claypot caramelized aubergine, and spicy tofu barbecued in a banana leaf. On the Hoi An riverfront an old lady in peasant gear offers us a cruise down the river in her old scow – $6 for one hour. The boat’s motor sounds like a one cylinder chaff-cutter and, as we clatter along, we pass duck farms and market gardens on little islets. An old couple on a low slung fishing boat are casting a net for fish. They don’t seem to be catching any so we stop to take a photo or two. They then row over and ask us for $1 for posing – which we happily pay. Later we realise that tourists were the only fish they were catching. 12/2/12 – 13/2/12. It’s time to take a bus along the coast road to Hue. The narrow, poorly maintained two lane road is in fact a major highway, with large buses and trucks passing recklessly. Near collisions are frequent and we pass the after math of an horrific truck head-on; the road is still covered with a mess of oil, diesel and blood. Alongside the road are plantations of eucalypts. Sunny explains that their wood is used for paper making; the leaves distilled into massage oil. Soon after, as if to illustrate his point, we pass a factory surrounded by mini mountains of chipped eucalypt. At last, we arrive at the Ideal Hotel in Hue – not my idea of an ideal hotel. Our room smells of damp and other members of the tour report the same. We’re only there for a night, so I console myself with a popular local beer, Huda; a pleasant drop with just a hint of sweetness. Like many Asian beers, this has rice as well as malted barley listed as an ingredient. Next morning we cruise in a large junk down the Perfume River – to look around the 17th century Thien Mu (Heavenly Lady) Pagoda and associated Buddhist monastery. Inside the temple, the monks chant their daily prayers. There is something a little awkward and spooky being part of a bunch of tourists gawking at and photographing them. To be continued. 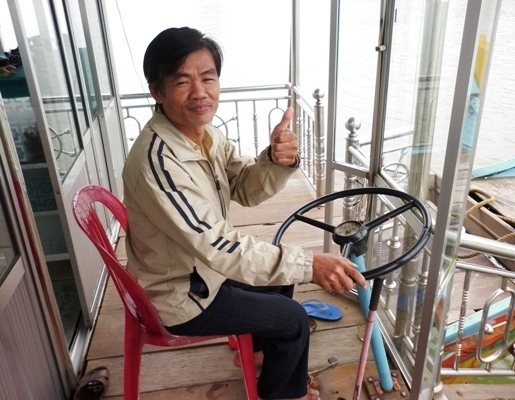 Next issue: Hue to Hanoi and Halong Bay. Disclosure: All travel expenses paid for by the writer. Details: Trip booked through Flight Centre. Costs per person: Singapore Airlines return, Brisbane to Ho Chi Minh/Hanoi, $1065. 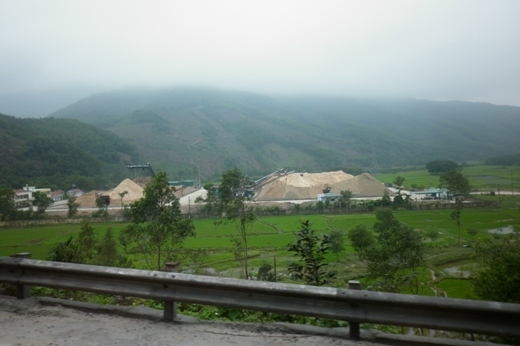 Ten day tour “Vietnam Express Northbound” with Intrepid Travel, $952. Extra nights at Hong Ngoc 2 Hotel, Hanoi, $66 per room per night. Transfers: Australian travel agents quote expensively for pre-booked cabs to and from Vietnamese airports, for example, $33 per person for Ho Chi Minh City and $37 for Hanoi. We used local cabs, which are safe and cheap. Expect to pay around $7.50 each way in Ho Chi Minh City and between $12 and $20 in Hanoi – that’s for the cab, not per passenger. This entry was posted on 16 March 2012 at 02:28 and is filed under Wine Travel. You can follow any responses to this entry through the feed: RSS 2.0. You can leave a response, or trackback from your own site. Good blog, thanks. Chris and I spent three weeks in Vietnam during january. Did Ho Chi Minh City (that everyone even Northerners call Saigon) Mekong Delta, Na Tran, Hoi Ahn, Hanoi & Halong Bay. First time for us and we loved it. Great diversity in cultures along the way. Loved Hoi Ahn the best. Yummy fish with cumin. Found french wine to be much cheaper than in Australia and why pay as much for something average, imported from Australia. So we drank a lot of Vietnamese beer and French wine. Yum!